The morning news-and-features program I usually watch while I eat my oatmeal had a discussion today about Rolling Stone magazine’s list of the top 500 (rock) songs of all time. The new edition of the list will be released Friday, but they discussed the top five this morning, conceding that the choices would be hotly debated over water coolers, coffee cups and dinner tables. As for myself … I wouldn’t have put any of those songs into my personal top five, but I could see the argument for each of them being there. I’ve mentioned before that music is a vital part of my life. The little songs my mother sang when I was a child. The hymns we sang in our little country church, and the choruses our church youth group performed for the congregation. The pop and rock songs that played from my transistor radio and stereo record player when I was a young teen, from the 8-track, cassette, CD and MP3 players as technology and I matured. Most days I turn off the TV as soon as the morning program is over and turn on my music player in its stead. I write to music. Music plays in my car between home and the grocery store or the mall. Our children played piano and violin and guitar and tin whistle as they grew up, and all three sang in high school choir. I miss hearing their practices and performances. 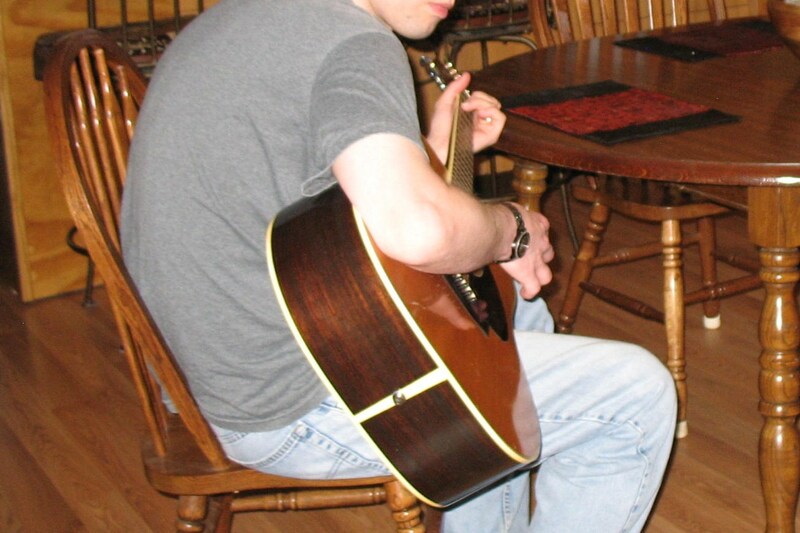 Our son-in-law is also musical — he’s playing the guitar in the photo above. Music is one of the many common bonds that have drawn him and my daughter together. Our middle child, Kerry (the one married to the guitarist), has often mentioned that one of her cherished memories of childhood is riding in the back seat of the car on late night trips home from some visit or vacation, dozing with her sister and brother and listening to the music playing from the car speakers while her dad and I talked quietly in the front seats. I can identify with that memory; hearing certain songs from the late 60s and early 70s can send me straight back in time to summer car trips with my own parents and three brothers, often to Branson, Missouri or Galveston, Texas. I cannot imagine a world without music, nor do I want to try. As the program concluded this morning, the on-air personalities were asked to name their all-time favorite songs, and I found their choices interesting. They mentioned yesterday that they would be doing so, and I’ve thought about it on and off since, wondering what I would name as number one on my list of favorite songs. I have a favorite gospel song, How Great Thou Art, and a favorite Christmas song, O Holy Night (followed closely by the secular White Christmas), but favorite pop/rock song was harder to choose. There are so many, some with deeply personal meaning, some I simply love to hear or to sing in the shower. Some that evoke special memories, others that can bring me to tears. I’ve decided to try to compile a list of my top 25 favorite pop/rock songs sometime, just to see what others think the list says about me. I can already name a few of the songs that will pop up — When Doves Cry, Stairway to Heaven, Old Time Rock and Roll, I’ve Done Enough Dying Today, Cherish, While My Guitar Gently Weeps, I Still Burn, From Where You Are, The Dance … oops, that list is already growing. It would be somewhat easier for me to name my top 25 favorite bands/singers — there are so many wonderful songs! But what would be number one for me? I think it would have to be In My Life by the Beatles (I was pleased to hear someone else name that one this morning, after I’d already chosen if for my own number one). I was just a little too young to be part of Beatlemania back in the day, nor do I listen to their music often now, but this song has always spoken to me, more so as I grow older. Every time it pops up on my work playlist — the newest of which includes 539 songs — I have to stop, close my eyes, and just let the memories and emotions flow. What does this choice say about me? I think it illustrates that I’m sentimental, nostalgic and have a weakness for simple melodies and harmonies. What songs would be on your life’s soundtrack? Which would be your number one, and what does that say about you? Until next time — may your days be filled with the music you love most. I realized long ago that I cannot choose favorite songs. I have them, I suppose, but they change with my mood and heaven knows I’m mercurial. This morning was a Seal morning. Yesterday it was Jazz vocal standards with Sinatra, Torme, Fitzgerald, Vaughan, and many more. A few days ago it was Jean-Pierre Rampal’s flute music and last night it was my relaxation mix with new age ambient, Tibetan monks chanting, and french horn sonatas. I rejected music recently for several months. I didn’t sing. I didn’t listen to it. I was in a terrible place. Then I began listening to my music again and so far I’m still listening some every day. I’m singing again too. And dancing more. I’m dong okay if I’m singing and dancing. I can’t write with music on. It distracts me too much. Somehow, though, I’m able to read with it on as long as it’s turned down. Interesting post, Gina. It’s funny how easy it is to take music for granted. But really, I can’t imagine my life or being me without it.